In the field of forensics, there is a critical need for genetic tests that can function in a predictive or inferential sense, before suspects have been identified, and/or for crimes for which DNA evidence exists but eye-witnesses do not. Molecular Photofitting fills this need by describing the process of generating a physical description of an individual from the analysis of his or her DNA. The molecular photofitting process has been used to assist with the identification of remains and to guide criminal investigations toward certain individuals within the sphere of prior suspects. 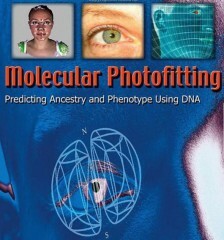 Molecular Photofitting provides an accessible roadmap for both the forensic scientist hoping to make use of the new tests becoming available, and for the human genetic researcher working to discover the panels of markers that comprise these tests. By implementing population structure as a practical forensics and clinical genomics tool, Molecular Photofitting serves to redefine the way science and history look at ancestry and genetics, and shows how these tools can be used to maximize the efficacy of our criminal justice system. Dieser Beitrag wurde am 20. Sep 2010 von Oliver Obst in e-Books veröffentlicht. Schlagworte: e-Books, Elsevier, Elsevierbuchpaket. 2018: Wie erkenne ich betrügerische Open Access-Journale?